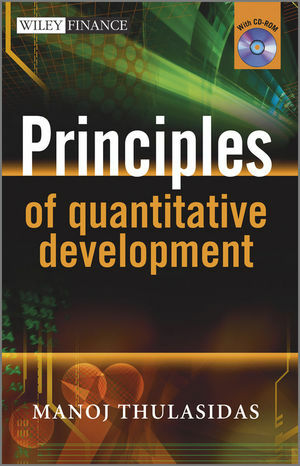 Principles of Quantitative Development is a practical guide to designing, building and deploying a trading platform. It is also a lucid and succinct exposé on the trade life cycle and the business groups involved in managing it, bringing together the big picture of how a trade flows through the systems, and the role of a quantitative professional in the organization. The book begins by looking at the need and demand for in-house trading platforms, addressing the current trends in the industry. It then looks at the trade life cycle and its participants, from beginning to end, and then the functions within the front, middle and back office, giving the reader a full understanding and appreciation of the perspectives and needs of each function. The book then moves on to platform design, addressing all the fundamentals of platform design, system architecture, programming languages and choices. Finally, the book focuses on some of the more technical aspects of platform design and looks at traditional and new languages and approaches used in modern quantitative development. The book is accompanied by a CD-ROM, featuring a fully working option pricing tool with source code and project building instructions, illustrating the design principles discussed, and enabling the reader to develop a mini-trading platform. The book is also accompanied by a website http://pqd.thulasidas.com that contains updates and companion materials. A physicist-turned-quant, Dr. Manoj Thulasidas works as a senior quantitative professional at Standard Chartered Bank in Singapore, focusing on the design and deployment of trading systems. Well recognized in his field, the author is a regular columnist for Wilmott Magazine, and has published several articles on a variety of topics related to quants and quantitative finance. Thulasidas received his undergraduate degree from IIT, Madras in 1987. A physics aficionado, he then studied fundamental particles and interactions at the CLEO collaboration at Cornell University during 1988-93. After receiving his Ph.D from Syracuse University, he continued his work at the ALEPH collaboration at CERN, Geneva. During his 10-year career as a research scientist in the field of high energy physics, he co-authored over 190 publications. In 2005, the author switched to quantitative finance, and joined OCBC, a regional bank in Singapore. He led the quantitative analytics team for pricing model validation and other mathematical tasks. This middle office job, involving risk management and curtailing ebullient traders, gave him a thorough overview of pricing models and, perhaps more importantly, a perfect understanding of the conflict-driven implementation of the risk appetite of the bank. Later on, he moved to Standard Chartered Bank, taking care of their in-house trading platforms, which further enhanced his "big picture" outlook and inspired him to write Principles of Quantitative Development. List of Figures, Tables and Big Pictures. 1.1 What is a trading platform? 1.2 Quants and quantitative developers. 1.6 Technical and business aspects of platform design. 2.2.6 Platform or quantitative developers. 2.3.9 Market risk management analytics. 2.3.10 Asset and liability management. 4.5 Queues and status flags. 5 Programming Languages – Basics and Choices. 5.2.3 Lexical structure of a programming language. 5.3.1 Basics of object-oriented methodology. 5.3.2 Advantages and disadvantages of the object-oriented approach. 6.1.3 Security and access control. 6.2.5 Trade transformations and operations. 6.2.6 Settlement triggers or pathways. 6.2.7 Batch processing and grid computing. 6.2.9 Security and audit model. 6.2.10 Documentation and support model. 7 Computing Patterns for Trading. 8 Flexible Derivatives Pricing Tool. 8.2 Design goals and features. 8.3.4 Generating a function template. 9 Pricing Tool to Trading Platform. 9.2.4 Security and access control.